Most central banks adopted Inflation Targeting when inflation was a real problem. The purpose of such a regime is to increase credibility, accountability and transparency for monetary policy and to permanently bring inflation to a pre-agreed target. The Fed decided to adopt such a regime at a time when inflation is not really a problem. Why would it do that? Finally, the FED bit the bullet and is now almost officially an Inflation Targeting central bank. I say almost because it does not formally embrace the Inflation Targeting framework. It does not have a policy horizon for the its target and it will not publish an Inflation Report. On the other hand it does publish forecasts for GDP, inflation, interest rates and unemployment. Only one or two other IT central banks publish forecasts of the interest rate path. Although the FED justifies its decision as a move towards more transparency it could blow up in its face. Unlike inflation, interest rates are used in day to day transactions and surprise deviations from the announced path could have real effects in the economy. Nevertheless, it seems that now the FED follows a model where it steers the interest rate in response to deviations of inflation, output and unemployment from some target. A lot of targets for one single instrument if you ask me and it could create confusion. At this point the “crowd” went wild. From the reaction of financial markets you would think that up until now the FED has not been doing anything. Unfortunately this is not true. The fed has been doing everything and more. The latest move is the FED’s of saying: ALL IN. The main question is if it would work. I have my doubts and here is why. 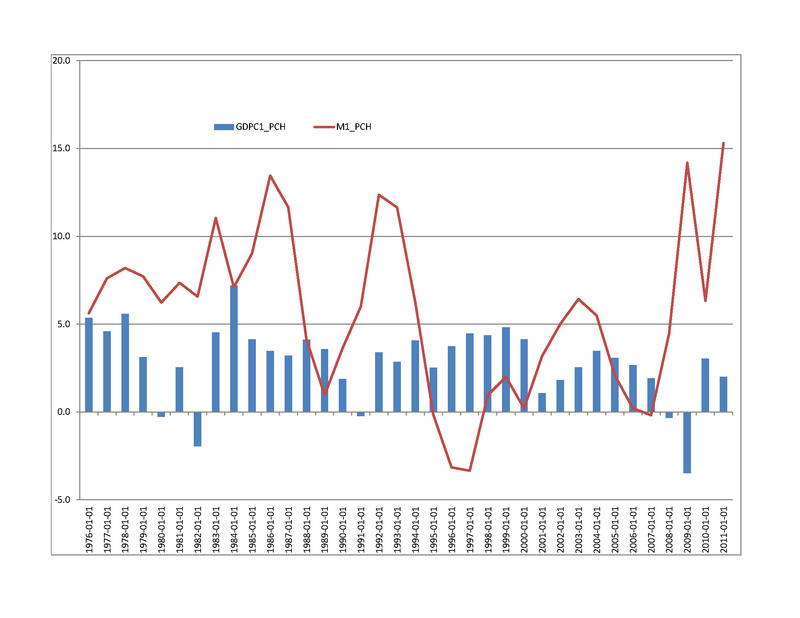 First graph shows real GDP growth and real GDP in billions USD. 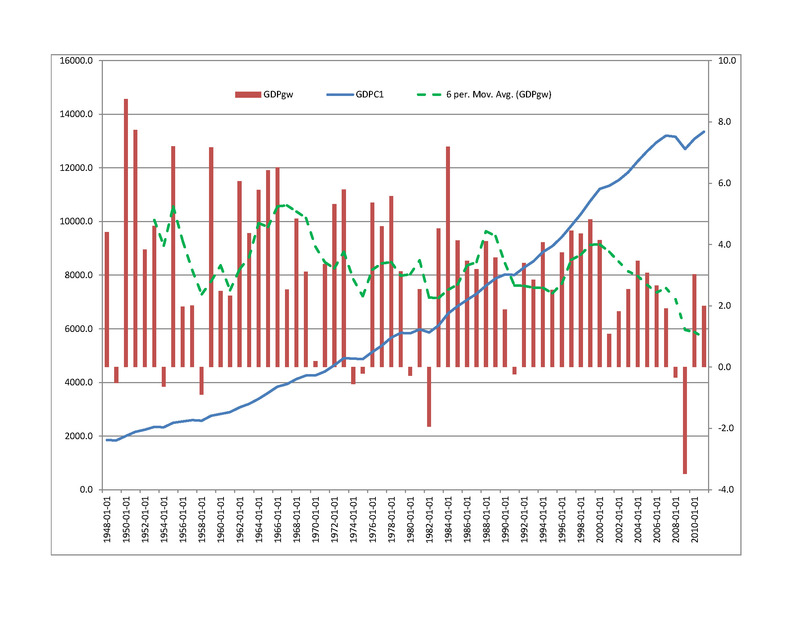 The green line shows the average real GDP growth for a period of 6 yrs. I use this period as since 1947 there have been 11 recessions or 1 every 6 years, almost. The interesting part in this graph is the fall in average growth over the 6yrs period since 2000. What is interesting to see is that the economy in 2010 and 2011 has behaved much like in 1982 delivering growth above the average for the business cycle. Let’s look now at real GDP growth versus the PCE measure of inflation. Once again after the drop in 2008 PCE inflation has recovered and is now sitting above the target of 2%. However, trend inflation has been falling since the 1980s and thus it was easier to bring it into deflation than it would have been in 1980. The main reason put forward by critics of the FED is the high unemployment rate. It is true that unemployment remains elevated. I am not sure how much more can the FED do here. As you saw above GDP is growing above the average for the business cycle and inflation is above the 2% target. And now the scary part. The FED has just committed to a highly accommodative policy until 2014. Also, the FED has been criticized that it has not done enough. The graph below paints a different picture. The FED has dome more than enough if you compare the real GDP growth with M1 (money supply) growth. In the last three years the FED has been doing everything it could to bring the economy out of recession. And in my view it has done a good job. Critics point to unemployment but that is really too much to ask from the FED. It will take sometime for unemployment to fall especially since the average real GDP growth has been declining in US since 2000. Pouring money in the economy will not solve this problem. My view is that job creation is linked to the fear that taxes will have to rise in the future. We will just have to wait on this one. Until then, for the short term markets received their “sugar rush”. At first their reaction does not make sense as markets should not get so excited when the FED tells them that all that is a ahead is a period of “moderate expansion”. But if you shorten the horizon and you put your “trader” hat on then you get it. We are playing the same game as we played since 2008. Central banks deliver short term funds that are used for short term gains. Nothing gets to the real economy in the form of business investment and it will not happen irrespective if the FED decides to do QE3, QE4 and beyond. However, I suspect that there is another facet to the latest move from the FED. It could well be that Bernanke is shouting to the world that there isn’t anything else he can do. In the best case scenario 7 years of highly accommodative monetary policy will deliver 2% real growth and 7% unemployment. And I have a feeling that this is for the most part the reason for why the FED adopted IT. It wants the clearly show the world that is out of ammunition. Here is something to think about: if that is the best case scenario then what is the worst case scenario for 7 yrs of highly accommodating monetary policy? P.S. The trend is in the eye of the beholder. 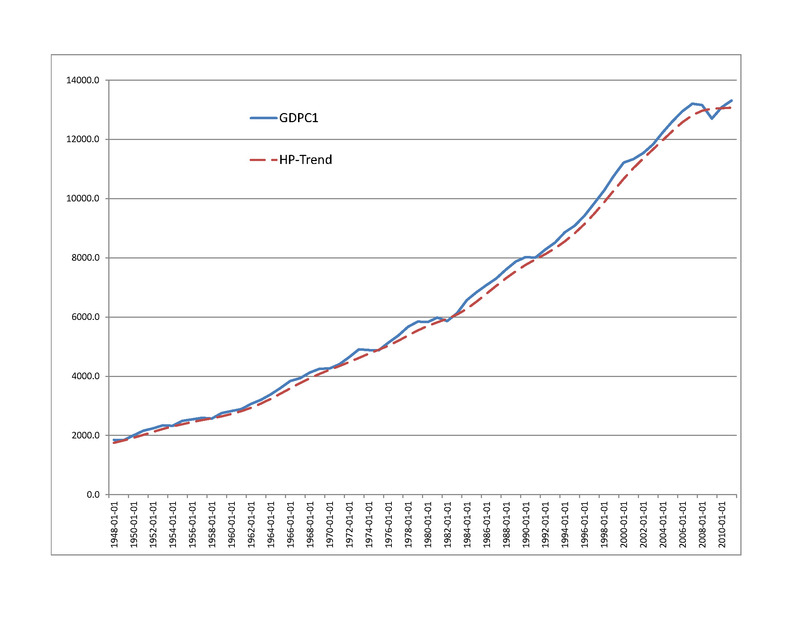 The graph below shows that if we use HP econometric technique to filter real GDP we have an interesting result: RGDP level is above trend. Should we save the RON? Over the past 50-60 years, the U.S. GDP growth is due, in a large measure, of public spending – and that means debt!!!! :):):) … And statistics show that in this period of time with each new unit of public debt, the added value produced is decreasing. A study of Erste Bank (named “In gold we trust” – which I like it very much, and I found it very interesting) shows that in the ’60s, every dollar of U.S. debt added 0.008 to $ 0.012 in the U.S. GDP. From 1970 to present, the ratio has declined, and now a dollar invested brings less than 0,002 dollars to the GDP (from four to six times less than in the 1960s). In other words…. (If we were to make an analogy with what happens in nature) :):):) it is clear that fertilizer substances increases land production. But … from a point on, every kilo of fertilizer will not help – but reduce productivity and actually destroying the soil. I suspect that lack of business investment has to do with fear of higher taxes in the future. But my point is that the FED has been really accomodative so far and the economy has responded well except for unemployment. But I think we are going to far asking the FED to keep pumping money for 7 yrs. NGDP is something like 13% BELOW TREND !!! Don’t you think that could explain a few things ? Are you implying that the fed should have done more??? How much more? What is the benchmark you are using? GDP will come back to trend in time. I do not know of any theory that says how long it should take NGDP to get back to trend. Maybe there is a lower trend going forward and NGDP is on it? Who says that a linear trend is the best approximation of how an economy develops in the long run? Forget all that, it seems to me that we are asking a whole lot from the FED while we forget about the burden of public debt and loss of competitiveness of US in the global economy. In the end the big question if you look at long term is if money matters in the long run. If you think it does than you are justified to ask the FED to keep the printers running for 7 yrs. But if you think that money in the long run is neutral than maybe the FED has done enough. Especially when no one seems to look at the worst case scenario. (the one at teh very end of the post). A short answer to your question would have been that it does not. why is inflation, PCE, above target if the NGDP is below target? I am adding one more graph to the post. Yes, it is neutral in the long run. But, to quote Keynes again – “in the long run, we’re all dead”. So I don’t think it would be of much consolation to the guy/gal who lost his/her job due to “tight money” to know that, in the long run, things will return to equilibrium. Am I to understand that negative nominal shocks do not have real effects ? 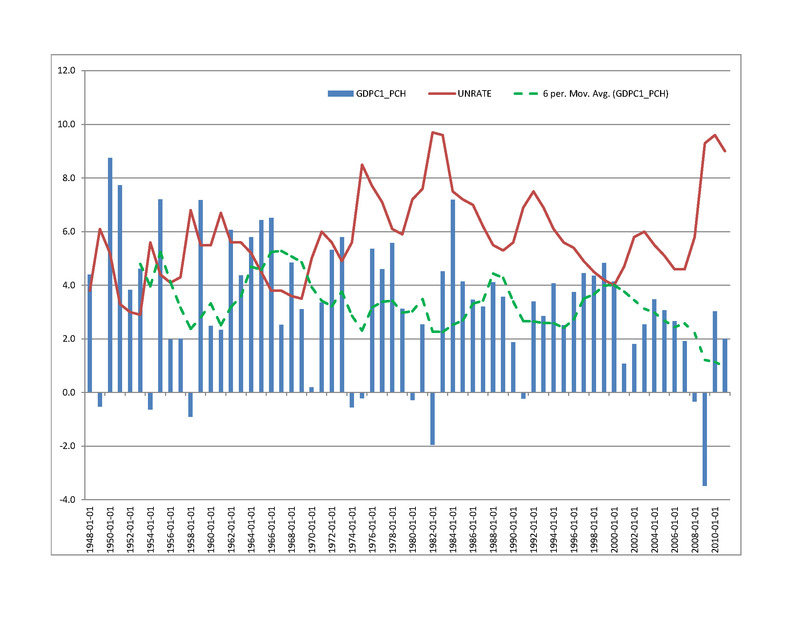 That a sharp fall in nominal expenditure does not a contractionary effect upon economic activity ??? Thus you are saying that there are rigidities in the economy and it takes time to adjust to the new norm. Could be. Romania is a perfect example of a nominal negative shock from monetary policy which led to recession. But US has reversed that and some. Do you want me to post the M1 level also against RGDP level? Ummm … WHY do we need a “new normal” ? What was wrong with the “old normal” ? Why can’t we get back to that ? Why does everyone focus on the tripling of the monetary base ? Yes, it has tripled … but the demand for money has also risen, more than enough to make up for that. And looking at that new graph you posted – really, man ? Do you honestly believe that the new trend is FLAT ? If you look at the 1980 recession versus this one you will see that then and today the economy grew above the average for the business cycle by the same percentage (almost). The main difference today is that since 2000 the average real GDP growth has been falling constantly. I am not sure what you mean by money demand has risen? are you saying that people and corporates are hoarding cash? why? if there is no inflation expected? If money demand has risen why has not consumption? Can you show me some estimates of the money demand to back this claim up? Bottom line, GDP has been growing above the average of the last business cycle in 2010 and 2011. Inflation is above 2%, the PCE measure used by the FED, and yes unemployment is still high. This while the FED has been very accomodative for almost 4 yrs. The question to policy makers is how will more of the same will help unemployment and why nothing has happened until now? Those two cannot both be true at the same time. 3. Low interest rates encourage commodities speculation especially food and energy and that puts a price squeeze on manufactures. Fed policy is not working, nor will it work. This is what happens when an academic wonk with no real-world practical thinking sits in a box with other academic wonks with no real world experience and they collectively divine economic policy as if they were god. The Fed is responsible for the housing bubble, the resultant collapse, and the anemic economic recovery. 1-4 You just don’t get it, do ya ? Let me put like this – this fixation on interest rates as sole instrument through which monetary policy can be conducted is an absolute disaster. Right now, nominal rates are close to zero, while REAL interest rates are in negative territory (are you even capable of making the distinction between REAL and NOMINAL rates ? because I highly doubt it). So in face of what is, by all measures, TIGHT MONEY – we have people like you who howl that money isn’t tight enough, we need to tighten them some more. In the face of an unprecedented collapse in aggregate demand and high unemployment !!! Thank you for making the case for “free banking”. Also true, but not for the reasons you think. People, we’re still “in the hole”. Yes, we’re slowly crawling our way out. But nowhere fast enough. At the rate things are going, it’s going a “lost decade”. And all because a bunch of ignorants worry about non-existent inflation. I do not think anyone is disputing that we should expect slow growth for the years to come. The FED made it clear withe their view on interest rates and so did everyone else. BUT is this because monetary policy is not doing enough? Or is it because public debt is skyrocketing and the agents in the economy know that they will have to pay it back at some time? My hypothesis is that monetary policy has done all that it can be done. But the channels through which is working, mainly the credit channel, are shot. It is time to look somewhere else for a solution. My suggestion would be to cut taxes. Unfortunately governments all over the world have so much public debt that cutting taxes will require drastic cut in public debt and expenditures. Not likely to happen and that is why everyone is looking at monetary policy for help. 1. What about the increased debt levels? The public US debt is not more than 15 trillion. Every man, woman and child in the United States currently owes $50,148 for their share of the U.S. public debt. One year back, the public debt was north of 14 trillion. It jumped with more than 1 trillion in about 1 year. And I’m not even talking here about the private debt. 2. What about the real inflation rate? Answer: They did it because they are lying about the inflation rate. Inflation, using the reporting methodologies in place before 1980, hit an annual rate of 9.6 percent in February, according to the Shadow Government Statistics newsletter. 3. What about interest on public debt alone? 4. What about the number of Americans on food stamps? It more than doubled since 2008. It reached 45 million in August 2011. No, I don’t think so. If that would be the main reason then business men will create jobs and then they will fire people when the taxes actually rise. The main problem is that they can’t really fire people at will and without a lot of headaches and additional costs. US is basically heading faster than ever towards poverty. You can’t actually be broke without getting into debt; as long as you provide for you the basic necessities. Getting into debt is the first step towards poverty. 46 million Americans as of Dec. 2011 are already on food stamps. This is the first sign. Higher public debt will in my view offset any increase in money supply. Higher public debt/deficits create expectations of higher taxes and interest rates. It could be that the FED wants to keep the key rate as low as possible to lower the financing costs for the government but it cannot go on forever. Regarding the last argument I am not sure, it is too micro level. I could see an argument in favor of allowing Americans to re=mortgage their houses at a much lower rate. On the inflation issue everyone has a different/favorite measure. I use the official one PCE index. By that measure inflation has been above target in 2010 and 2011. It is odd to say that there is slack in the economy when inflation is above the target you chose. I guess you are saying that some of the reasons for which the FED will keep rates low until 2014 do not have to do with monetary policy. Well, hard to prove for or against it. However, from what we have seen in the last 4 years 2014 seem very far away and a lot may happen. I am looking forward to see what all these years of negative real interest rates and skyrocketing public debt have done to the long term growth perspectives for all these countries. Higher public debt will in my view offset any increase in money supply. Higher public debt/deficits create expectations of higher taxes and interest rates. Ricardian equivalence arguments make me sad. There is no need to be sad, you just need to find a better explanation for why people and corporate are not investing or spending. As I wrote above, it’s not just the debt. It’s all the interest. Soon enough the interest will equal the entire sum they get in taxes. How about that? That’s like playing a game you can’t win in the long term. It’s not too micro-level. It’s how business people think. They will hire someone if they see the opportunity. But when they can’t easily fire the person, they risk too much. It may be worth right now to hire but if suppose that it will be hard to get rid of the person because of regulations, their risk appetite decreases. The inflation is not measured properly. They don’t take into consideration every expense. Their decisions have to do with the monetary policy. But the results of their actions have side effects in the standard of living of the Americans. The average American become poorer with each day. And one way to see that the poverty is increasing is to count how many people live on food stamps. There are 46 million and the number is growing. Growth in term of GDP doesn’t matter. Example, if you buy your second car, it helps the GDP but you don’t actually need it. Also, if you start a mortgage, it looks great in terms of GDP but the standard of living is not much different compared with renting a similar place. Saving your money doesn’t count as GDP but it is a good practice. Care to say how much of that they owe it to themselves? No, they don’t owe it themselves as individuals. They owe it to themselves as a nation. That’s not the same thing. It’s not like every person and child gave $50.148 to the US government. First, the difference in contribution matters. Second, let’s say that you gave $50.000 for the pension fund or for any other fund. (It’s not the fund that matters.) And the fund manager buys US bonds with your money. You gave that money for a reason. You will have to receive something in return. So if the US government no longer pays it back, you will lose partially or totally the service you paid for. I take you subscribe to Bernanke-san’s “creditism” ? If banks would rather hold on to the money (btw, you do know that the Fed is paying interest-on-reserves, right ? If that’s not a contractionary measure, I don’t know what is) … there are still plenty of other ways to conduct monetary policy … How about direct intervention in the FX markets ? Also, Bernanke-san continuously insists that the Fed isn’t out of options – he just doesn’t feel it necessary to use them. If you’re right, he’s lying. I do not subscribe to any “ism”. I look at the data, however distorted and biased it is. I do not take some theory and try to adjust the data to fit it. when do you say that a central bank has absolute control over NGDP/AD how do you see this working out? and if it does why has not worked so far? 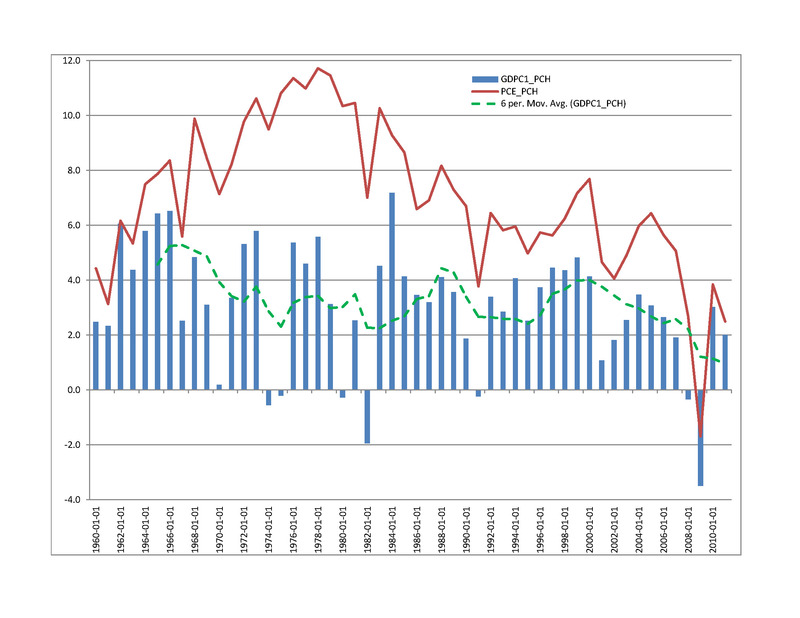 how is an FX intervention different than outright increasing money supply? What extra incentives are created for banks not to hold onto cash? Yes the FED is paying interest on reserve but do you know what that rate is? I tell you .25%. How can a negative real interest rate be contractionary? If banks are not able to find other investments that pay 0 for the same risk than we have bigger problems. To make me understand better can you please tell me how you get to NGDP below 13% and the assumptions you use for this estimate. Also, what is the mechanism you have in mind when you say that the central bank has absolute control over the NGDP/AD? In my view the FED is shooting blanks.Bernanke knows it very well but he has to keep a straight face. Yes, the FED has more options. I can start buying stocks, houses, durable goods etc. In the end we can ask the fed to be the private AD. Theoretically it is an option. The question is if we really would like to be in an economy where the private sector produces to sell to the FED. How long do you think that economy will remain stable? Those two cannot be true at the same time. You are splitting hairs. However, Real rates are negative in the US, thus the FED has created inflation. I do not see the connection with NGDP/AD though. When I referred to shooting blanks I was considering short term effect of loose money on AD. Now that I put those two sentences back into context where they should be judged, let me know the your view on the questions I asked below. Real rates are negative in the US, thus the FED has created inflation. Thus? Really? Can you please explain more how do you get to see it this way? If you like it better you can say that the FED has lowered rates enough to be real negative. But you still need some inflation as rates are not zero, especially long term ones which count for business investment. No I am not splitting hairs. I am trying to make a very important point … yet you keep missing it (must be some sort of cognitive dissonance). We have an NGDP that’s 13% below the trend at which it has been growing for the last 25 (or so) years. We have high unemployment and an economy that is clearly running below capacity. Now I don’t know about you, but that to me tells me that we are dealing with a lack of aggregate demand – and that means that money is not “loose” ! And who is in charge of the nominal side of affairs ? Who has absolute powers over how much money is spent ? The logical conclusion from all of this would be that if the likes of the ECB or the Fed truly wished it, they could easily boost nominal spending – and raise aggregate demand. Yes, that would mean a period of higher inflation until we catch up … Yes, everyone takes a hit – but we’re back on the road to growth. Just to be clear, you assume that the economy is growing long term around a linear trend. You also assume a constant slope to that trend. Hence, the current level of NGDP is 13% below that long term trend. It is one way to look at an economy, but by no means the only or the true way. Repeating the same thing without any proof a million times does not make it right just repetitive. You say that the unemployment is the result of an economy running below capacity. In other words you are saying that labor and capital are underutilized versus some unobserved measure. What is that measure may ask? What is the rate that you think it matches your perception of full employment and where capital is used in the most productive way. To you the logical conclusion to boost AD is just to increase the money supply. But what if the shock from higher money supply is offset by expectations that taxes and interest rates will rise in the future due to high public debt? What is the formula for AD that you have in mind? Does money enter directly in that formula? IF yes how? this is you idea of creating growth by cheating creditors to the government and savers of their return?? No to mention the real purchasing power of poor people that cannot diversify. On a more conceptual level, if everyone takes a hit simultaneously how do you create long term growth? you say “I suspect that lack of business investment has to do with fear of higher taxes in the future.” What if it has to do with microeconomics? What if it is not profitable to invest therefore not much related to animal spirits? What if there is in fact business investment but outside USA? You have to factor in the whole picture including all the Pareto relevant variables, and allow for accurate data (see questionable inflation rate, or the way GDB is computed via heavy beefing up by hedonics etc. google for chinese version of US GDP). How about factoring in regulatory arbitrage brought on by “Globalisation”? It could be all of the things you mention. Higher taxes in the future means both lower profit and investment outside US. My hypothesis is that current policies in the US have created incentives for investors to either hold on to their cash or spend it somewhere else. Although, US companies in vesting abroad are counted in the GDP. But it could be that foreign companies do not find it profitable to invest in US,except for Chinese in bonds. Florin, care sunt sansele in opinia te sa avem un default local in 2013? 5%? CDS%? 50%? Fara sau cu un default Elen? E foarte greu sa ai default in sensul ca nu se platesc obligatiunile statului scadente. PEntru datoriile in lei BNR va finanta orice suma prin sistemul bancar. Bineinteles ca pe termen scurt dar va face tot ce trebuie ca statul sa plateasca. Pentru obligatiunile in EUR se va face ce s-a facut si pana acum eliberarera de rezerve iar acestea vor fi folosite pentru a finata statul. Dar ca si in UE acest echilibru pe termen scurt mi se pare foarte instabil si cu efecte in alte parti dinn economie. Cel mai frecvent este ca inca ne luptam cu arieratele in Romania. Singura sansa sa nu creasca deficitul in 2013 este sa creasca impozitele. Dar chiar si in aceste conditii este greu de crezut ca in momentul in care va incepe plata datoriilor pentru scaderea datoriei publice deficitle nu vor creste din nou peste 5%.